I have had a packet of dried chickpeas in my pantry for months. A packet that i carried all the way home from Spain but never got around to cooking. Mostly because I forgot to soak them. They are big chickpeas – bigger than the ones we can buy in Ireland by far – I’d say double in size and delicious when cooked. It may sound mad to get excited about chickpeas but soaked overnight and cooked for 30 minutes they are ready to go, unctuous and creamy, which is quite something. The one’s we buy locally take three or four times as long to cook and are like little bullets. 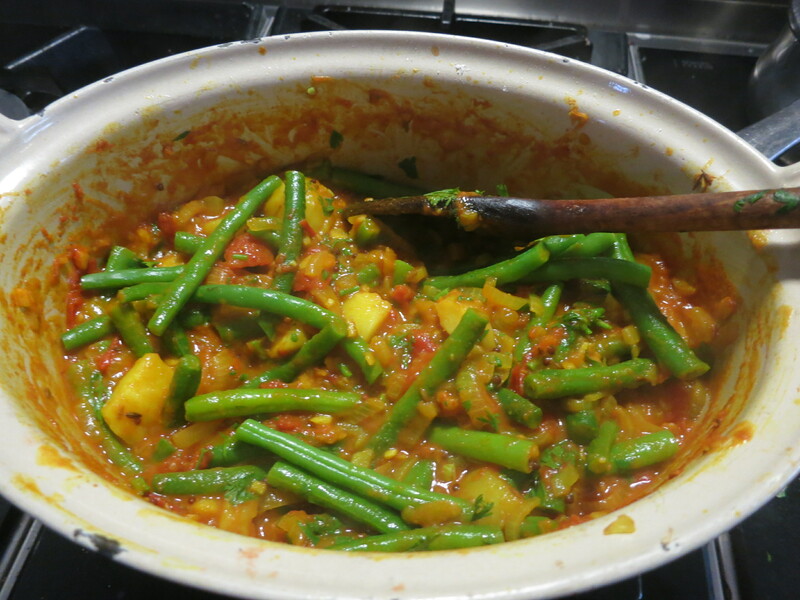 It’s still the holiday season here and we have been valiantly making our way through our veg box which together with the pre-cooked chickpeas offered numerous possibilities for dinner. The winning dish was also a lazy dish. It didn’t take very much effort, more the availability to give the odd stir. Take time sautéing the veg, they will become sweet and more flavoursome. Heat a frying pan or skillet. Add the olive oil and the chopped onions, give them a stir and when they are sizzling season with a little salt. Stir in the fennel, celery, bay leaf and carrots, give a stir and when the veg are all sizzling season with a little salt then turn the heat to medium/low. Cook, stirring now and then, gently sizzling for ten minutes. Add the chopped garlic then continue cooking for five minutes. Heat a small pan, add enough olive oil to cover the bottom and the bread cubes, fry until they begin to go golden then add the almonds. Cook for another couple of minutes. Putvthe bread/almond mix in a processor together with a clove of garlic then buzz to a crumb. A couple of left over spuds and a bucket of beans was the starting point for last nights dinner. 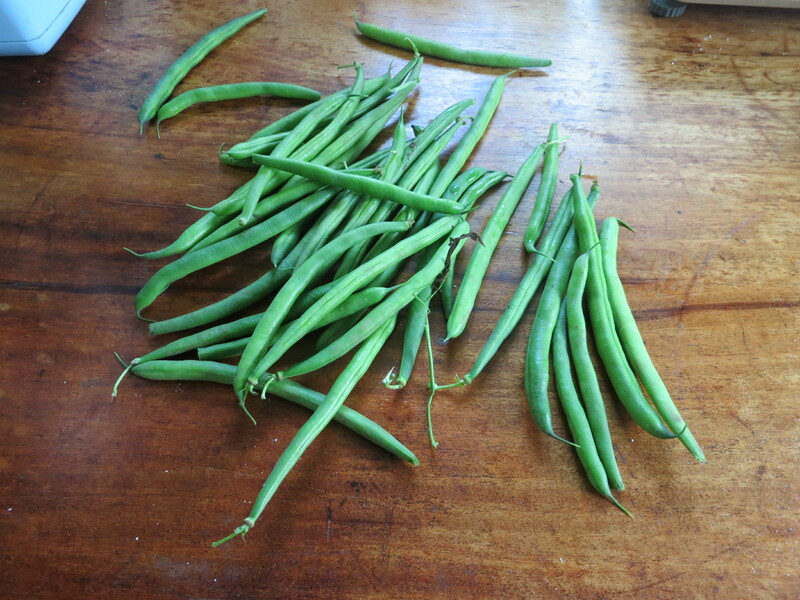 The beans in the garden are finally ripening. We’ve borlotti beans, runner beans, French beans and cannelini beans, all ready for eating right now so we’re eating beans with everything. 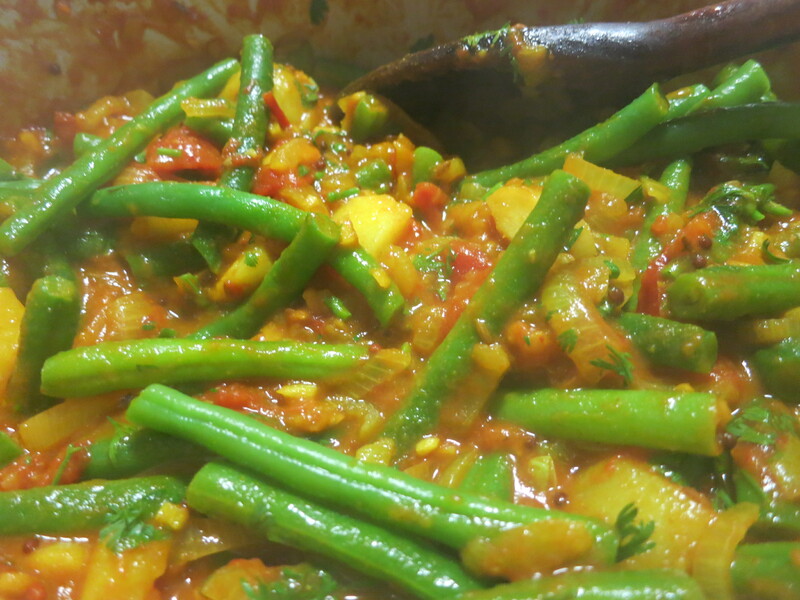 Yesterdays dinner was Indian style French beans with tomatoes also from the garden. These just picked veggies with their big bold flavours stood well with the spices, complimenting each other rather than being taken over. Peel and slice the onions. Heat a medium sized pot and melt the ghee. Stir in the onions, cook them for about 5 minutes then stir in the cumin and mustard seeds, cook 5 minutes more before stirring in the garlic and ginger and cooking for a couple more minutes. 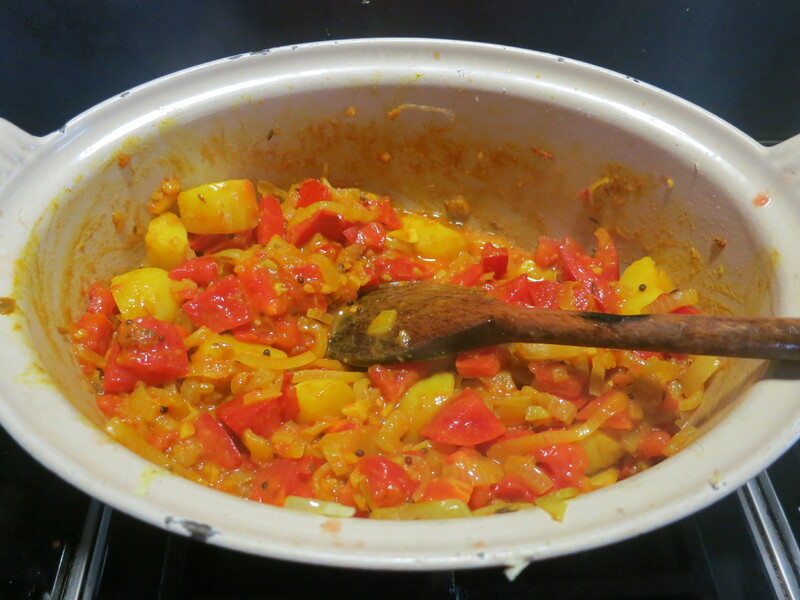 Season with a little salt and add the coriander and turmeric, stir to mix with the onions and cook for a few minutes. Add the chopped tomatoes, when everything in the pot is bubbling reduce the heat. Cook until the tomatoes have broken down then simmer gently for about fifteen minutes. Bring a large pot of water to the boil, add a little salt and the beans. Cook the beans for four minutes then drain and add to the sauce.Leave to cook for a couple of minutes then take off the heat, stir in the chopped coriander and serve. We ate this with brown basmati rice and a little yoghurt on the side.